It’s been a little over a month since we had our new Bosch dishwasher installed, so I thought I’d give a review of how it has gone and what we think so far. We had it replaced after the old one sprung a second leak. For the record, we purchased the model SHX3AR75UC. It was one of the highest rated dishwashers on Consumer Reports and received a ‘Best Buy’ recommendation. I looked around and ended up purchasing the dishwasher at Sears. I actually ordered it online. At the time, we were able to purchase installation and delivery. I purchased it on a day when Sears was offering a discount of 10% on all appliances, plus I was able to use a $50 off code that I found. The dishwasher retails for $799.99, and our total bill was $784.91, which I thought was a good deal considering that price included delivery, installation, new hoses, and sales tax. Sears used to be the top destination for appliance shopping, and though they’ve taken some steps back here, I was very satisfied with the purchasing experience. As mentioned, we purchased the delivery and installation, but since we bought it online, all we could do was pick out our date. We placed the order on November 20, so I was a little bummed when the earliest date available was December 4. That’s two full weeks. I ended up selecting December 6, being that was a Friday. I received a call a few days later to confirm the date. I missed the call but the message said that I had to call back to confirm the date. I thought this was a little odd since I had already selected the date online. Still, I called back and confirmed, and was told that I would receive a call the night before from the tech to schedule the exact time. That call did come, at around 8:45 on December 5. I thought it was a little late, but regardless, he was able to schedule the install for the next afternoon right at the time I’d wanted. He showed up on time, and even called before as I’d requested. He did a very professional install. When he saw our old dishwasher, he joked that it was the loudest one ever made and wondered how we had put up with it. He said that it’s a standard builder grade that costs the builder around $85, and that they still sell them today! He was very courteous, even confirming that it was OK to drill a hole in the side of the cabinet, pointing out that the old hose had been run incorrectly), and asking because he didn’t want to scare our son, who was watching from a distance. He gave us a quick run through and answered a few questions we had. My only complaint about the install is that the tech reeked of cigarette smoke. I’m guessing that he smoked in his van and that his clothes had absorbed the odor. We’ve run a number of cycles and I am very impressed with the cleaning. I’ve found a total of one item that had a small speck left on it. This is in sharp contrast to our old machine, which always seemed to leave food caked on somewhere. I’m also impressed by the fact that the machine takes a lot less soap. With the old machine, we filled both containers (the pre-wash and wash) with soap. Now we fill one container, and per the recommendation of the instruction manual (which, yes, I did read), we only fill it about one-third full for most cycles. All told, we’ve probably cut our soap usage by 80%, which will re-coup some of the cost of the machine over time. The machine comes with a whole slew of cleaning options, but we’ve only used the ‘Auto’ option which is good for most cycles. It claims to check the water quality to know when the dishes are clean. So far, it seems to work fine. Some of the other cycles are ‘Heavy’ for items with heavy grease, ‘Half’ if you are running a partial load, or ‘Express’ which will run in about half the time but should probably be run right after the dishes are used, so it doesn’t have to spend time getting anything caked off. You can also have your dishes sanitized, in which case it will heat the water to near boiling. For the most part, this is a wash compared to our old dishwasher. 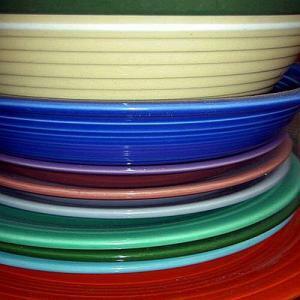 It actually seems to hold more plates, it holds roughly the same amount of glasses, but where it takes a step back is with bowls. 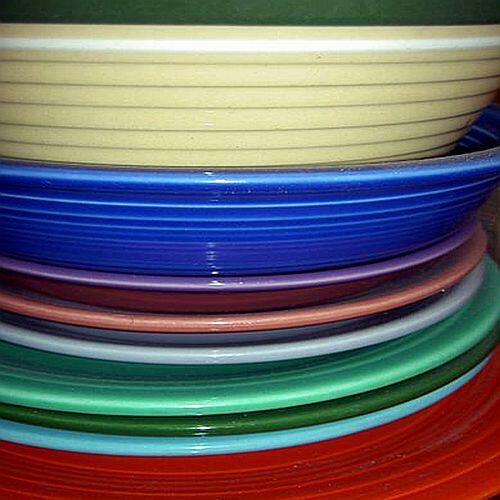 The issue we have is that we have Fiesta dishware, which is very thick. As such, there’s no well designed place for the bowls to fit. All of the loading spindles are angled, which works great for the plates, but they’re all spaced throughout the machine that the bowls don’t fit well between any of them. We make it work, but lose a good deal of loading capacity in the process. From an overall capacity standpoint, the tub is much bigger than the old one. They apparently make the tub bigger by taking away space underneath, so there’s less room for the motor and such. The top shelf is adjustable and will even wash wine glasses (something we haven’t tried yet but seems to get good marks from other reviewers). I overlooked the fact that the machine does not have an electronic drying element. Back in my single days, I rarely ever used this feature, but my wife always has, especially when we had babies that drank from bottles, and we would use the extra heat to sanitize the bottles that were washed in the dishwasher. Now, you can still sanitize (see above) but instead of relying on the heat, this machine will superheat the water. We don’t have any need for that. Even though the machine doesn’t have an electronic drying element, it runs air through the system, and also requires Jet Dri or another agent, and things come out relatively dry. If I prop open the door after the cycle runs, virtually everything is dry within an hour, even plastic which tends to hold onto droplets for the longest time. It’s a minor step back, but it’s no big deal at all for us. The change in the noise level is astounding. When the old dishwasher was running, you couldn’t be on the first floor and carry on a conversation, listen to music, or watch TV without going slightly mad. With the new dishwasher, you can stand right next to it and still hear everything else just fine. It’s remarkably quiet. The stainless steel looks great, and it is further enhanced by the fact that the control panel is on the top edge of the door, so you really have a very clean look, just the panel and handle. Bottom rack alignment – The bottom rack has rollers that run on the inside of the door for sliding it in and out. There’s no real grooves or track for the rollers, so if you don’t pull the rack out perfectly from the middle, it will inevitably lose its alignment, forcing you to pick up the entire rack and maneuver it back into place. Though the weight from adding dishes seems to help it, there have been times when we’ve had to do this with a bunch of dishes in the thing, which isn’t fun. This is a common complaint. Odor – One thing I read when researching these is that some Bosch dishwasher owners reported that the inside of the machine smelled stale. I have noticed this to a minor degree. Bosch has never acknowledged the problem, but the general consensus is that the issue comes from the fact that there is very little room under the dishwasher, so if there’s a U-shaped trap under, it likely holds very little water and could be allowing some odor to filter through. It’s not bad, and generally seems to be noticeable if we don’t run the machine for more than a couple of days. It’s not a big deal at all, but I hope it doesn’t present as more of a problem when the summer months hit. Inside material – A couple of years ago, Bosch went from a full stainless steel interior to a mix of stainless steel (walls) and plastic (bottom). I point this out simply to advise anybody looking at this review to make to check that they haven’t switched out other items in the name of cost savings. Buttons – As mentioned, the controls are along the top edge of the door. The controls to start the machine or to change the cleaning type are done via buttons. I would have preferred touch pad controls versus having to depress a button, as I feel that the button is more prone to breakage. We run our dishwasher roughly every two days, and so far we’ve been very happy with it. The machine seems to clean well, it’s very quiet, and has a sleek, modern look. Though it has a few faults, I would expect that every dishwasher is going to present issues of some sort. From an operational, design and value perspective, I would recommend this dishwasher without hesitation. The true test will be to see how long it holds up. The cheap, builders model that cost $85 was loud and leaky, but it kept going for 14 years. Bosch, you are officially on the clock. I just ordered it yesterday! In the referenced post, I noted that I had discovered a small leak under the dishwasher, thanks to a water sensor that I had placed there. When I first discovered the leak, I figured that was it, that it needed to be replaced. Then, I got to thinking about it, and decided to do a little investigating. The water spot on the floor was pretty small, so I thought that I’d take a better look and see just how it was leaking. I improvised, and found the lid to one of the storage totes that everybody has these days, and was able to slide it under the dishwasher. I then ran a cycle and was able to observe that it did leak, but only a few drops during each time the machine was adding water. All told, it probably leaked a grand total of a quarter cup of water. I ended up simply leaving the lid under the machine. It was big enough to catch all of the water (protecting my subfloor and drop-ceiling underneath it), and the small amount of water made it so that it evaporated quickly. Every couple of months I would pull the lid out and scrape the crud out, as it seemed to leak a little soapy water. 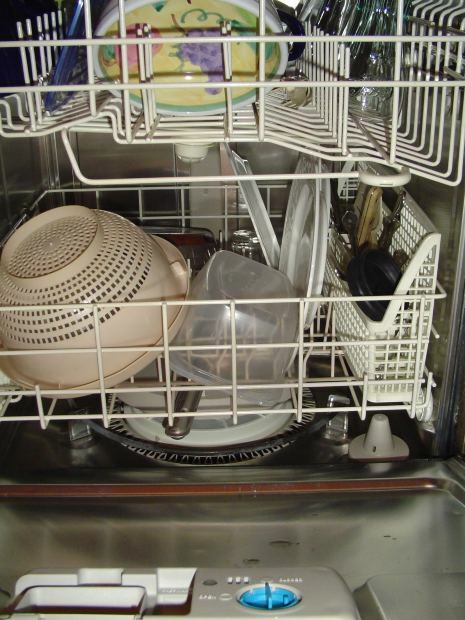 That little trick extended the life of the dishwasher by almost two years! Unfortunately, it sprung another leak last week. I noticed this one after coming downstairs in the morning (we usually start it before going to bed) and finding that the rug that sits in front of the sink and dishwasher was soaking wet. Yikes. After drying out the rug, I figured I’d take a look upon the next cycle. Sure enough, it was now leaking out the bottom of the door. It appeared that the seals or something were finally giving way. I was able to jerry rig another way to catch the water so that we can still continue to run cycles, but it requires taking off the bottom part of the panel each time so that I can place a container to catch the water, which is unsightly, and with two kids that like to explore places, having the wires and such sitting exposed was probably not safe for the long term. Funny About Money recently went through a new dishwasher purchase, and when I left a comment that we were in the market, and why we were, she wondered if we could replace the gasket around the door. We probably could, but by this point I’d had enough. The dishwasher is original to the house, so just over 14 years. It’s louder than all get-all. It was likely the cheapest model the builder could get. We also have white appliances, and while the panel was still white, the plastics around the controls had faded and were a dirty yellow. Plus, having gotten 22 ‘free’ months out of it, I was fine with getting a new purchase. So, here’s how we went about selecting and ordering the dishwasher. Consumer Reports – My dad has a lifetime subscription, so I was able to check out the ratings and such. It seemed as if Bosch had the best value for what we were looking for. The top rated Bosch model was something like 6th rated overall, and was half the price of the five models above it. There were a few other Bosch models all clustered around, so I started looking around. The real price – Consumers suggested that the price should be around $700. This was fine, but I knew I’d have to pay for installation, taxes, and accessories. Even tax alone would make the $700 price $742 here in Michigan. Still, my goal was to keep it as close to that price as possible, so I knew I’d have to look for a deal. Given that the old machine was still functioning, I had time on my side. First look – I looked around a bunch of sites. Everywhere I found had the ‘total’ cost around $900, which is what I figured the $700 would turn into after installation and such. Still, I figured I could do better. Sears – I settled in on Sears as the primary store which I’d check. I did some checking on the Slickdeals.net forums, and found that they typically have some sales right before Black Friday. I actually got a hold of their Black Friday ad, and while they did show that dishwashers would be on sale, they were specific and none were highly rated. Other stores Black Friday checks showed the same thing: good deals on crappy machines. Sure enough – Slickdeals forums were right. Just like last year, about 10 days before Thanksgiving had a 10% off sale on all appliances. I also found a $50 off $300 or more purchase that I was able to apply. That took the price of the machine down to $580. Delivery and installation is a flat $150 through Sears. You also have to add in an accessory kit for around $17, and sales tax. All told, my out-the-door price was $780. So, considering I’d started off with the $742 expectation, I figured $38 over that to add in the accessories and installation made it a reasonable deal. To fridge or not to fridge – We decided to go with a stainless steel front appliance. Even though this would be a contrast to the rest of the appliances (white microwave, white oven/stove with a black door, and white fridge), our thought is that appliances fail, we’d like to replace them, and maybe eventually have matching fronts. The night before the sale ended, my wife brought up the idea of looking into a new fridge. Even though ours works, we have pretty limited fridge space, and we’ve always talked about having a ‘basement’ fridge. So, I looked into the idea. Again, using Consumer Reports, I focused on the highest rated models that would fit into our area. The second highest french-door/bottom-freezer model was suggested at $3,100 according to Consumers, but Sears was offering it on sale, plus with the 10%, it would have been around $1,600. I’m expecting to get a $1,000 payout at the end of the year when we get our vacation paid out, and I floated the idea of using our budget on each other to offset some of the remaining cost (my wife was cool on this, but I think I could have talked her into it). In the end, I felt like we came up with that so much at the last minute, that I wasn’t comfortable. Of course, this means that my fridge will fail any day. But, honestly, I’d rather use the $1,000 to cover the cost of the dishwasher and have a little remaning, versus applying it to something else and not even have it cover the full cost, not to mention that we’d have to go further into savings to pay for the dishwasher. From what I’ve been able to tell, it seems a little easier to get deals on fridges, so we can continue to look and make sure we do the right amount of research, and have a full understanding of how it’s being funded. Impulse buying is not usually my thing, and I know I would have had regrets on a $1,600 instance. Panic moment – Even though I researched everything, I had a panic moment about four hours after placing the order. I realized that dishwashers come in smaller sizes, and ohmygosh, did I order a dishwasher meant for a smaller size hole? In other words, I knew my dishwasher was 24 inches wide, but was that the standard size for a dishwasher? Turns out, it is. I was fine. Phew. Delivery – Right now, delivery is scheduled for December 6th. That seems a ways out, and I’m wondering if it’s further out because of ordering online than if I had made the purchase in the store. Still, I suppose I can limp by, or maybe give a call and speak to someone once the order is fully processed. For the record, I’m completely fine with paying someone to install this thing. I don’t do well with plumbing, electricity, or working in cramped spaces, and installing a dishwasher is three for three on those, so let someone else have all that fun. So, has anybody else done any appliance shopping? How’d it go?